Our design company has been very creative with ways to maximize the space in such a small dwelling. The shipping container homes are very small, especially if you are only using one. Naturally when you merge two or three together you increase your floor space. Finding designs for container homes can be quite challenging and costly. This is why our company will have standard container home designs available for sale at one tenth the cost. The price is $40 for the standard set of homes. This includes floorpans and sketch up designs on 8 different styles of shipping container homes. These Blueprints and floor plans are typically used for estimating and lending purposes. 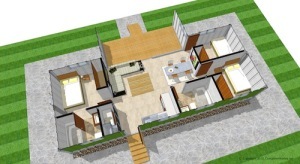 A single set of blueprints is sufficient to study a home in greater detail. For the standard set of Shipping Container homes. This price includes floorpans and sketch up designs on 8 different styles of Shipping Container homes. E-mail us the description of your project and we will send you a quote. Electrical Plan: This is a suggested location of the entire electrical plan for the home. An experienced electrician should be consulted on this matter. Hi I was just inquiring about financing for a container home. For example after you get a blue print when building a non-container home you can get a loan to build generally. Does any one know if you can do the same with a container home? If so who will and what do you need to qualify? Just saw yr message. The difficulty with a container home is that a lot of banks worldwide are considering them as mobile homes. It is a fact that if you get a loan and you do not pay the bank timely and move your containers elsewhere the bank has nothing to put a lien on. It is not easy. I know that in Europe it has been done but than the bank is asking for additional collaterals.